No offense to He-Man or the Transformers, but the real kings of the toy aisle in the '80s were GI Joe. The Real American Heroes had the widest, most varied toyline, to say nothing of the cartoon and comic. Of course, those two bits of cross-marketing were wildly disparate: while Cobra in the cartoons was hiding missiles inside fast food franchises, Cobra in the comics was actively (and effectively) destabilizing foreign powers. 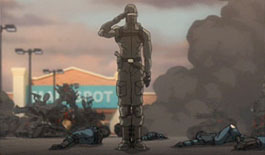 Long have fans wondered why the cartoon couldn't be more like the comic, and this year we finally got our wish in the form of GI Joe: Resolute. GI Joe is a highly trained, classified special operations unit composed of men and women from around the globe. Officially, these warriors don't even exist. Few know the truth - that GI Joe fights a secret war, as the first and last line of defense against forces that seek to plunge our world into chaos. Wherever there's trouble, GI Joe is there. 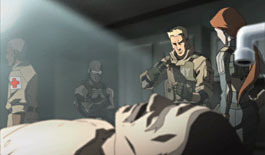 In GI Joe: Resolute, the raging battle between GI Joe and Cobra Commander has never been more intense. Every life is at stake... and even the good guys can die. All games end today... Now you know... and knowing is half the battle. Resolute is a new continuity, not following off the comics or the cartoon, but it does have elements of both. 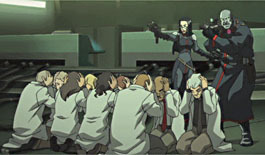 Producer Sam Register, the former VP of Cartoon Network, wanted a more mature story, and so he called writer Warren Ellis to handle the script. Ellis contested that he had no idea what a GI Joe was, and Register said that made him the perfect choice. Resolute isn't some fanboy's paean to the 1980s, it's a good story in its own right. The plot isn't anything groundbreaking: Cobra threatens the world, the Joes rally to stop them. Lather, rinse, repeat. But that's not the point. Ellis took the old conflicts and recast them in a world with consequences. A world where people can (and do) die. Hasbro's official synopsis said "No parachutes. No lasers. No rules," and they meant it. Yes, this is the same old story: Cobra Commander's big schemes, the Joes' indominable will to stop him, all that. But it's also deeper and more brutal, like a real (sci-fi) war would be. 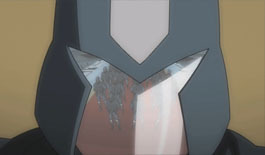 In fact, just to underscore the changes, the series opens on a character death - a longtime fan-favorite character, too. Things quickly spiral out of control, too, culminating in Cobra Commander making demands in front of the UN, and proving he means business, in the harshest way possible. Meanwhile, Storm Shadow invites Snake-Eyes for a final confrontation, leaving Scarlett to decide where her loyalties lie. The Joes have to scramble to figure out how Cobra is doing what they're doing. Communications are down worldwide, and Cobra seems to be able to strike anywhere. Even once that mystery is solved, it's still a question of rooting Cobra out - this attack was long in the planning, so they were sure to be dug in deep. In finest GI Joe tradition, this story ranges all over the globe... and even above it. We get lots of exotic locales, and even the craziest of them have real-world counterparts. 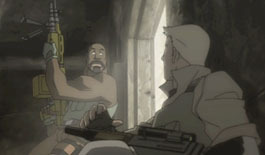 Many classic characters make appearances in Resolute, though not all speak - let's face it, voice actors are expensive. Heck, every voice in the cartoon is done by one of four actors. Ellis' first draft had many more speaking roles, and he had to excise a bunch of them in later drafts. Still, there are 20 different Joes and at least 10 different Cobras (not counting the scores of Cobra Troopers individually, of course), so there's a good chance your favorites will at least get a cameo. The old technology gets an update, as well. 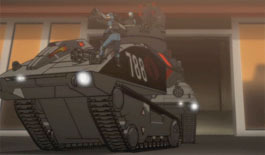 A lot of action takes place on the Flagg, for instance, and Cobra rolls out a fleet of HISS tanks. The Joes have helicopters and jets, and who's to say those aren't the Resolute versions of the Dragonfly, Tomahawk, Skystriker or Conquest X-30? That fleet of automated drones defending Cobra's home base? Trubble Bubbles. It's stuff you're familiar with, just pulled roughly into the future. 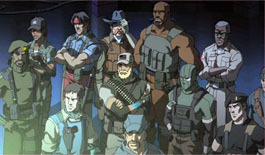 The character designs in Resolute were handled by comic artist Dave Johnson, whose stylish graphic skills grace the covers of 100 Bullets (among others). The art is just slightly angular and chunky, giving it a look that is distinct among Western animation. The actual work was done by Titmouse, the same folks behind Afro Samurai, Metalocalypse and the recent G4 microseries Slasher School. 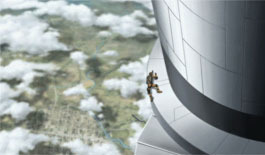 The animation is fluid, and the scenery lush; Resolute looks terrific. The series was directed by Joaquim Dos Santos, who also did some Justice League Unlimited and Avatar, so you know he can handle action. Resolute was released as a series of 10 five-minute webisodes, but the story still flows nicely once it's all put together. When the series was shown on Cartoon Network, each segment still had its Resolute intro and outro, but those aren't present here. If you don't know where the breaks were, you probably won't be able to guess. Picture quality is good, even blown up on an HDTV. Since this is animation, there aren't a lot of solid blacks, but the dark areas still have a lot of information. There's no blooming in the colors, but in some scenes, the digital coloring becomes apparent when the gradiants present specific steps rather than a smooth blend. However, we can gladly report that there's no edge enhancement, and absolutely no interlacing errors, so the drawings always look their best. The audio is Dolby Digital 5.1, and while the mix probably won't wake the neighbors, those firefights definitely pack a punch. There's no unwarranted hiss in the audio, even in Cobra Commander's sibilant S's. The Resolute disc itself is a bit lackluster. The packaging art is nice, but there's no kind of insert inside and the single disc is just the plain gray label Universal puts on its discs. We couldn't get a Cobra logo or something? Yeah, that's a minor complaint, but it's still something that could have been worked on. Heck, the dvd menus aren't even animated, and that's almost a given in this day and age. We do get some decent bonus features, beginning with the "Now You Know" teaser shown at SDCC '08. It wasn't intended as a specific part of the story, just a brief 2-minute scene that gave fans their first taste of the tone of the cartoon. This has so far only been available online as shaky camcorder footage from the Hasbro panel, so including it on the disc was a great choice. 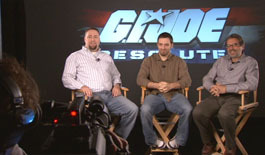 Next is the 10-minute "Interview with the Filmmakers," a feature previously available on Hasbro's GI Joe: Resolute website. We get the director, of course, along with executive producer Steve Drucker and lead background and prop designer Dan Norton. 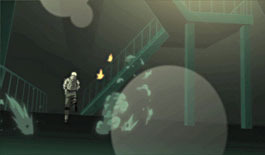 They talk the genesis of this project, explain some of the choices made, and even answer fan-submitted questions. All of these guys are the same kinds of geeks we are, and it's clear they had a blast doing it. There's a storyboard slideshow of the Snake-Eyes/Storm Shadow fight, which is rather disappointing: yes, it's beautifully drawn and highly complex, but any feature where you need to constantly hit the left and right arrows to make your way through is cheap. Plus, in the Interview, dos Santos mentions a few deleted scenes that made it to the storyboard stage, so why don't we see any of those? A sticker on the front of the package warns us that the disc includes exclusive missing footage - where's that? Is it the "Now You Know" promo? If so, we cry "gyp!" Finally, we get Joe Files, eight bio entries that were also available on the Resolute website. If you ordered the disc from Amazon, you also got an exclusive digital comic, writen by Larry Hama for one of the scrapped comic packs. Unfortunately, the disc doesn't include any of the website content unlocked via the Mission Codes shown after each webisode - another no-brainer. GI Joe: Resolute was completed before Rise of Cobra came out, and there were a whole lot of fanboys making snide comments about how "this was the GI Joe movie we should have got!" That's a typically hyperbolic overstatement, but Resolute really is good. Very good. 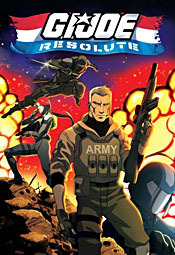 Unlike SpyTroops or Valor vs. Venom, Resolute wasn't made to tie in with a toyline - it was just made for us, the original fans of the Real American Heroes. The only bad thing about it is that it's just an hour long. Resolute definitely leaves you wanting more.